We have just had the special time of Christmas, Gifts are very likely to have been given to those we love and to our friends to bring them some joy. Perhaps you received the gift of socks, a jumper, tools for DIY, Or maybe a box of your favourite chocolates. If you were given socks for a christmas gift, you would wear them to keep your feet warm. A jumper would be used to keep our main body warm, DIY tools would be used to decorate or make home improvements and of course chocolate would be eaten and enjoyed. I am certain whatever gift you may have received, that you would’ve said a grateful thank you to the person who thought enough of you to give you such a gift. Today we celebrate the Important Feast of Epiphany, the actual unwrapping of the Christmas gift the Lord has given us. This is no ordinary gift!!! We are all given the ultimate gift, the gift of Chirst Himself!!! The Lord gives us his heart, his love, his mercy, and his ever unflinching determination to see all get the salvation that only Our Lord can give! But what are we to do with the extra special gift the Lord has given each of us? We are to use them in our daily lives, to become ever closer in our relationship with our Lord and to bring others out of darkness and into the saving light of the Lord. The wise men were led to the Holy Babe and King by following a bright star that led them to the place where He was lying. They heard the words: “Rise! Shine! 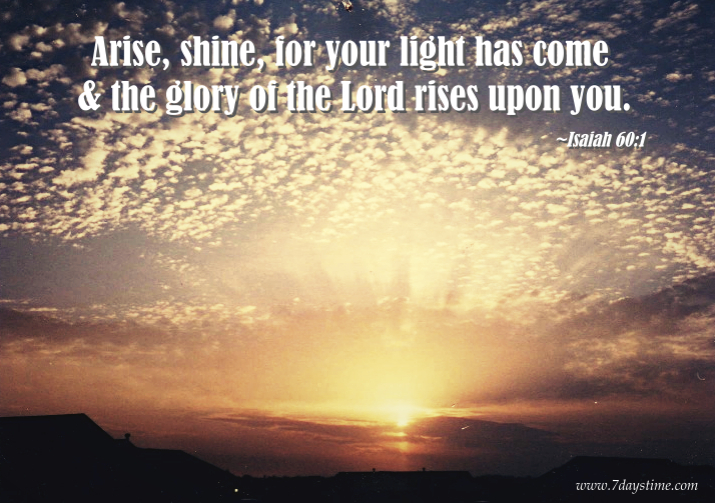 Your light has come!” The Lord shines his light for us through his holy word in the scriptures, and we are to rise up and shine the light of His love, mercy, and salvation for all to see, like the brightest torch shining the way in the darkest of nights!! The Lord was born, suffered and died out of his love for each and every single one of us so that in Him all that truly believe will never die but will live with Him forever in his eternal love. We are called to be His church in the world until his return we must let all people’s throughout the world see the light of the Lord through our lives, our teachings, our thoughts and our deeds so that all may see the Glory of the Lord. So let us now anew thank the Lord for his wonderful gift to us by rising up and letting his light shine through us! !